PARADISE, Calif. (Reuters) - Two deadly wildfires fueled by "devil winds" tore through opposite ends of California on Sunday, with residents urged to heed evacuation orders by officials forced to leave their own homes. 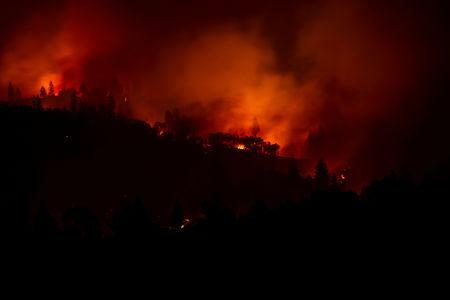 In northern California, the Camp Fire is one of the deadliest and most destructive in the state's history, killing at least 23 since it broke out on Thursday northeast of Sacramento and consumed much of the mountain town of Paradise. More than 100 were reported missing. "We are entering a new normal. The rate of spread is exponentially more than it used to be," said Ventura County Fire Chief Mark Lorenzen, noting at a press conference that California's fires in 2018 grow far more quickly than they did even 10 years ago. "Winds are already blowing. They are going to blow for the next three days. Your house can be rebuilt but you can't bring your life back," said Chief Daryl Osby of the Los Angeles County Fire Department. Crews pushed forward to achieve 25 percent containment of the Camp Fire in northern California, which had burned 109,000 acres (44,000 hectares) at the edge of the Plumas National Forest, according to Cal Fire's website. In Southern California, where the Woolsey Fire scorched 83,275 acres, the blaze was only 10 percent contained. "We're putting everything we've got into the fight against these fires and this request ensures communities on the front lines get additional federal aid," Brown's letter said. Trump, on a trip to France, said in a Twitter post early Sunday, "With proper Forest Management, we can stop the devastation constantly going on in California. Get Smart!"